Welcome to RooterStar, where we are always ready to roll out our unprecedented red carpet service whenever you need a plumbing issue solved. Serving Southern California and the Greater Los Angeles area, our full-service plumbing company has offered emergency residential and commercial services for over eight decades. Our mission has always been to significantly enhance your overall quality of life and peace of mind by making sure that we perform the job right the first time. With many years of plumbing experience, our fully trained and certified professionals provide high-quality work that exceeds industry standards. Whether you need a sewer line fixed, general repairs for a leaky faucet, improved drainage, more efficient water supply, or a pipe installed, RooterStar is the most reliable and qualified company you can call. From everyday problems to more complex tasks, we’ve never encountered a Los Angeles plumbing problem that we couldn’t tackle! For almost all home and business owners, a plumbing problem can result in a great deal of stress and inconvenience. Since we understand that residential and commercial plumbing issues can’t wait, we proudly offer our revolutionary services 24 hours a day. Finding an experienced plumber in Los Angeles can be a little overwhelming. But whether you need someone immediately or just soon, our residential & commercial plumbing technicians are ready to service all of Los Angeles & Southern California. 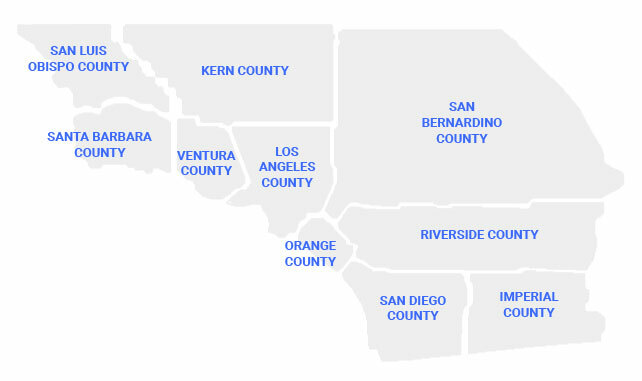 Our service area stretches as far south as San Diego County, inland to Imperial County & Riverside, Orange County, San Bernardino, Kern County, Ventura County, Santa Barbara & even San Luis Obispo. Why should you hire us for your plumbing needs in Los Angeles, California? Aside from the assurance that you’ll gain knowing that our professionals are qualified to complete the job, our company offers free visual estimates so that you will know the cost of the service before we begin. Our upfront and clear pricing encourages you to feel confident in your decision to trust us solve to your our plumbing problems. At RooterStar in Los Angeles, we know that in order to be the best plumbing specialists serving Southern California, we have to spend time and energy to ensure that we always stay on top. When you choose our plumbing and/or rooter services, you can expect our professionals to arrive on time and prepared to solve your issues. Contrary to other plumbing companies, we don’t keep you waiting and wondering when the professional will show up. I would highly recommend this plumbing company! I had to have a sewer lined replace due to some tree roots. They have fair prices and the service is exceptionally fast. I was truly impressed by their work and professionalism. After a horrible experience with another plumbing company, I called RooterStar for my clogged drain. Luckily, they had someone at my doorstep within a hour of me calling. He completed the job in no time. Thank guys! You are the best rooter in los angeles.